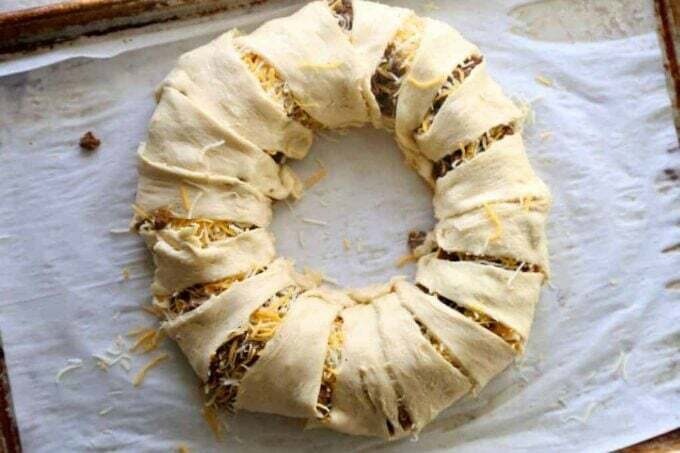 Beef Taco Ring made with Crescent Rolls! An easy appetizer for a crowd! Looking for an easy appetizer? 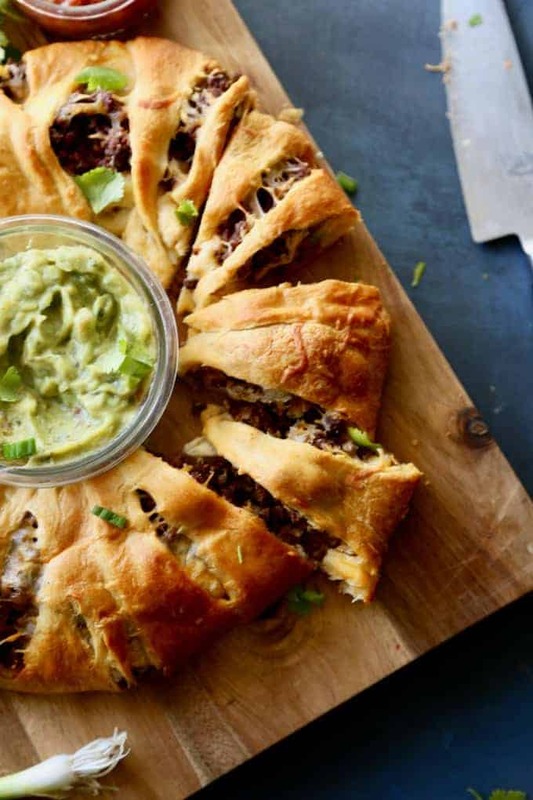 This Beef Taco Ring made with Crescent Rolls is all that and more. 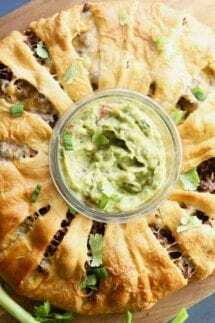 Great appetizer for a crowd for your next party or game day! 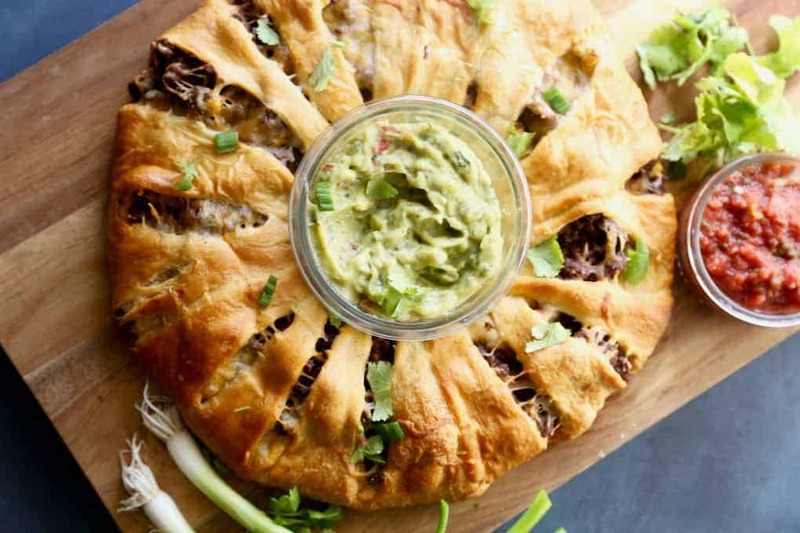 This Beef Taco Ring is one of the most popular appetizers we have made to date. It is extremely easy to make and comes together in a matter of minutes. Because it uses store-bought crescent dough, there are not a lot of steps. Howdy folks! Jackie from The Seaside Baker is back again with another easy recipe, perfect for entertaining – The Beef Taco Ring! Don’t be scared by the picture – it is beyond easy to make! You will not believe it, but it will WOW your guests! Now, I’m not a huge football fan (quite frankly I don’t understand it one bit) but I do love me some football food! So much so that we have friends over almost every weekend to watch the game and it is a fun mini potluck each time! Another great and easy appetizer for your football crowd (or any crowd for that matter) is Princess Pinky Girl’s Crockpot Nacho Cheese Dip. 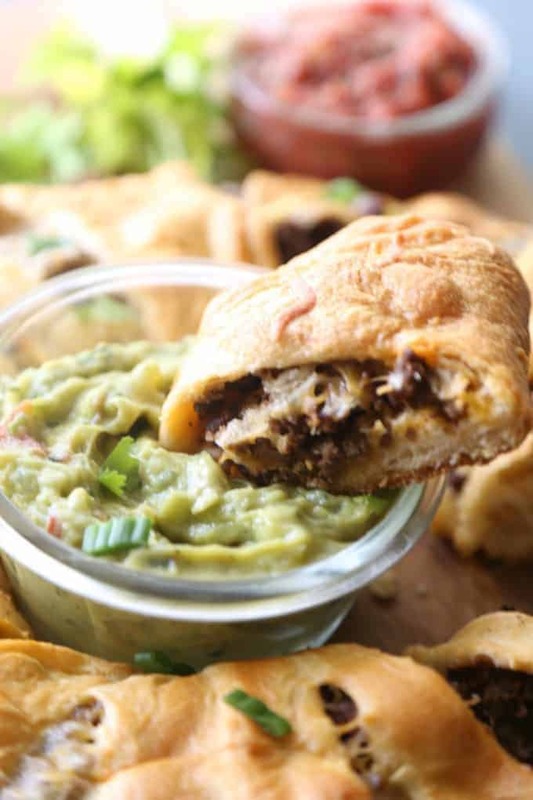 Serve that with some chips and this Taco Ring and you are good to go! 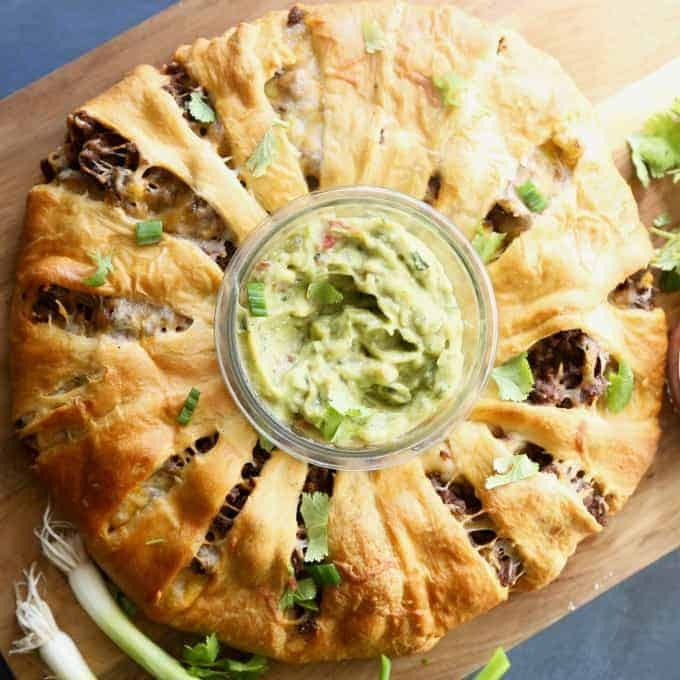 This Beef Taco Ring is one of the most popular appetizers I have made to date. It is extremely easy to make and comes together in a matter of minutes. Because it uses store-bought refrigerated crescent dough, there are not a lot of steps. 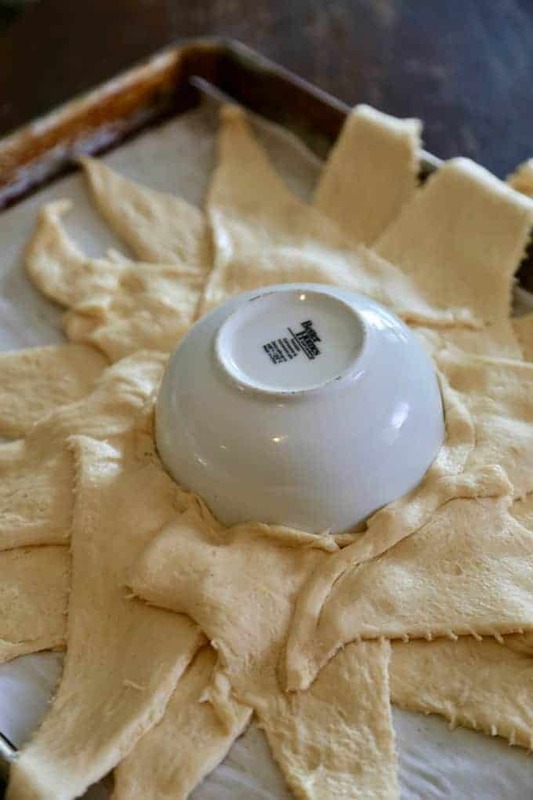 Simply layer the crescent dough triangles in a circular shape, spoon the meat and cheese onto the dough, and wrap. It bakes up in about 20 minutes and is ready to serve. Slice and serve with some guacamole and salsa for a delicious game day treat! 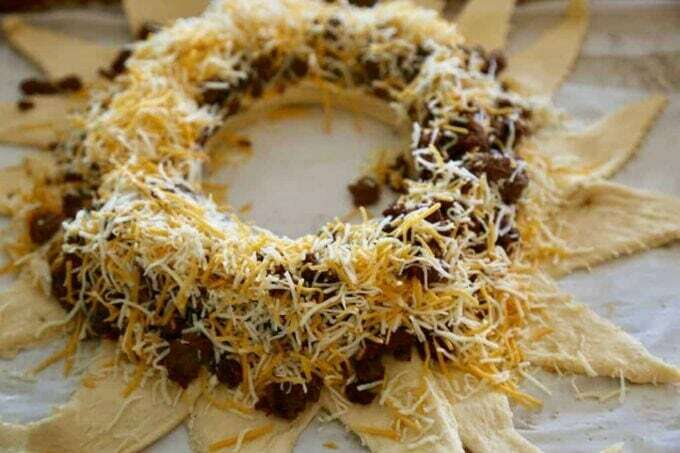 Love this Beef Taco Ring recipe? Tag us! I have been known to serve this for a quick and easy dinner too. On nights where time is tight, it makes a delicious meal served with some rice and beans. Best part is that the cleanup is minimal. With little prep dishes and the simple slice and serve, it is the perfect recipe. Looking for some other quick and easy dinners? We love these Crockpot BBQ Chicken Sliders. You can literally throw everything in the slow cooker in the morning and come home to a dinner that everyone will love! For more delicious Game Day Eats, check out my blog! I have some wonderful Buffalo Twice Baked Potatoes, Beef Enchilada Taco Boats, and Mini Football Chocolate Cakes. Game on friends, and may the best team win! On ungreased large cookie sheet, arrange crescent dough triangles in ring so short sides of triangles form a 6-inch circle in center. Dough will overlap. Spoon ground beef over wide section close to center. Sprinkle cheese on top. Bring each triangle tip up over filling, tucking it under bottom layer of dough to secure it. Place a bowl of guacamole and salsa in the center of the ring for dipping. Optional: garnish with shredded lettuce. Add ground beef and taco seasoning and cook until meat has browned. Remove from heat and set aside. Bake for 20-25 minutes or until ring turns a golden brown. Allow to cool for 5 minutes before slicing. Place a bowl of guacamole and salsa in the center of the ring for dipping. Garnish with shredded lettuce, if desired. This would get gobbled up like crazy on Sundays during the game! Not only is this delicious, it also is gorgeous on our dinner table! Will make again! Love that you’ve given step by step instructions. Definitely makes me feel like I can do it too! Soooooo glad it was a hit! Want to make for a Care Calendar. Can it be made in morning , refrigerated, and baked in evening?